It isn’t often that a historic estate with 21st-century features, finishes and amenities is available at a 20th century price, and yet that’s exactly what is on offer at the Pabst Mansion on Sheridan Road in Glencoe, Illinois. Sited on 2.2 acres, the 14,000-square-foot house was built in 1936 by architect Willian Pereira. On the market for two years, the price was just reduced to $3.9 million, nearly $3 million less than what it sold for in 1999 at $6.95 million, according to the Cook County Recorder of Deeds. The current owner, who bought the home in 2014, originally listed it for $6.3 million in June 2015. In May 2016 the asking price was lowered to $4.95 million and since then, has reduced the price several times before this latest drop. 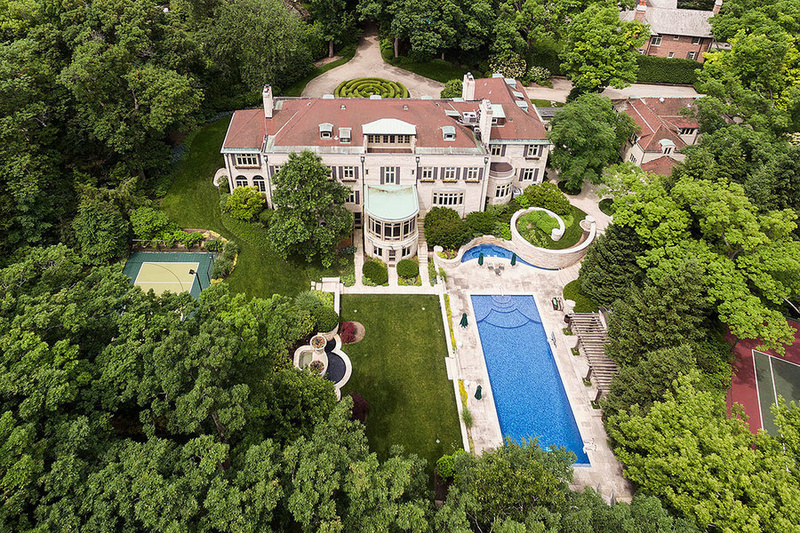 Crain’s Chicago Business first reported the price reduction, noting how the house’s sale price has decreased from the 1999 price tag, in each of the mansion’s subsequent sales. It sold for $5.2 million in 2009 and $4.8 million in 2014, when it was bought by the current owner, an insurance executive, according to the public records. Sited on 2.2 acres, the 14,000-square-foot house was built in 1936 by architect Willian Pereira, who became famous in later years for his work in California, including the Los Angeles International Airport’s space-age control tower and the Transamerica pyramid in San Francisco. The house is known as the Pabst Mansion because of its first owner, Harris Perlstein, who ran Milwaukee’s Pabst Brewing Co. after the merger with his company Premier Malt Products. On the inside, the house’s details and amenities are extensive. There is a large oval dining room, a paneled library, a bar and entertainment room, a game room, an exercise room, and a party-sized screening room, according to the listing agent. Situated at the end of a long gated driveway, the grounds include a pool with water slide, a half basketball court and a hedge shaped like a maze. “The new price is an extraordinary value,” said Coldwell Banker listing agent Wendy Friedlich. This entry was posted in Luxury Homes, Luxury Housing and tagged chicago, Pabst Mansion on September 5, 2017 by Bone Fish. “Increased every year. (Every year they’re increasing?) Yes, every year,” North Side resident David Chang said. “(00:15:35)We are much better off today than we were five years ago,” said Alexandra Holt, Chicago budget director. At Chicago’s City Club, Holt said Chicago’s looming $137 million deficit looks a lot better than $654 million projected at this time five years ago. Mayor Rahm Emanuel said the city had no choice but to raise money for pensions to spare the operating budget. “There is a real financial cost and economic cost to the city if you don’t address the problem,” Emanuel said. Former Gov. Pat Quinn has a petition drive underway to appoint a consumer advocate to help homeowners appeal their tax charges. “The best way to do it is at the ballot box by gathering signatures on petitions like this one,” said former Illinois Gov. Pat Quinn. The city has scheduled three more tax increases for police and fire pensions and still has not addressed a deficit in the retirement fund for city workers, not to mention a newly-authorized property tax hike to pay for teacher pensions. “The city says they might have to go up again. Yes, and I might not be able to stay where I’m staying. I’ve been there 40 years and I don’t know if I can stay any longer,” South Chicago resident Doris Hood said. The city council has approved a plan to rebate a few hundred dollars to the lowest-income homeowners if they apply. It should also be noted that the Chicago School Board is expected to approve a $250 million property tax increase for teacher pensions at its meeting later this month. The Cook County Clerk’s office released the 2015 property tax rates on Monday for the entire county. While the northern and southern suburbs of Cook County can expect a slight tax bill increase of 1.7 percent and 2.1 percent, respectively, Chicago’s property tax bills will rise by 12.8 percent. According to the Clerk’s office, citizens of Chicago who paid an average tax bill of $3,220.32 in 2014, will pay an average of $3,633.19 on their 2015 bills, an increase of $412.87. Cook County property taxes are paid in arrears, meaning the bill for 2015 is paid during 2016. The Clerk’s office says that this substantial increase is due the city being reassessed in 2015, which resulted in a 9.3 percent increase in the equalized assessed value citywide. The equalized assessed value, or EAV, is a multiplier used in calculating property taxes to bring the total assessed value of all properties in Cook County to a level that is equal to 33.3 percent of the total market value of all the real estate in the county. The Clerk’s office is quick to note that a majority of Chicago’s tax increase is due to the city increasing the pension portion of its levy by $318 million. As a result of the reassessment, the Clerk’s office says the city tax rate actually increased less than one percent compared to 2014. Cook County is divided into three areas, Chicago, northern suburbs, and southern suburbs, which are reassessed every three years. The southern suburbs were reassessed in 2014. Chicago was reassessed in 2015. The northern suburbs will be reassessed in 2016. Tax bills for Cook County property owners are due August 1, 2016. This entry was posted in Uncategorized and tagged chicago, chicago property taxes, property taxes on August 5, 2016 by Bone Fish.